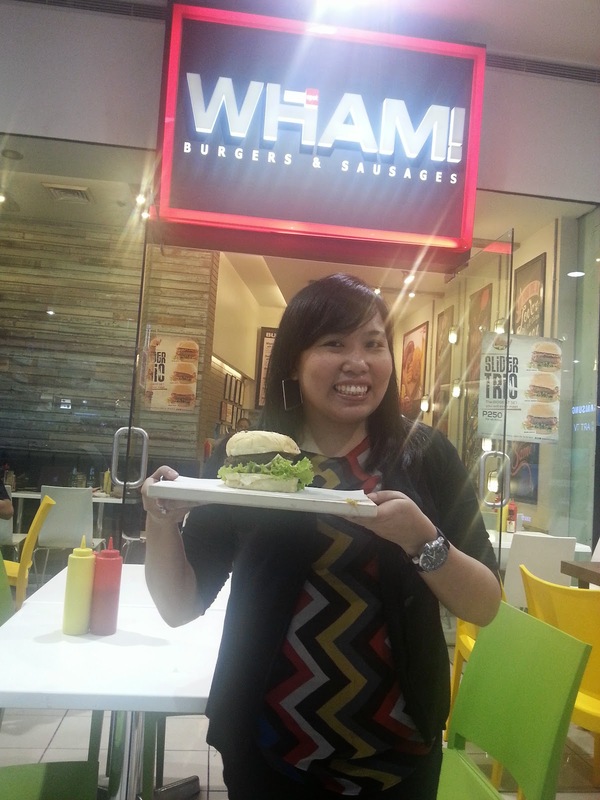 I know a lot of you are familiar with Wham Burgers, especially their Katipunan branch. And did you know that they're now on its 11th year?! 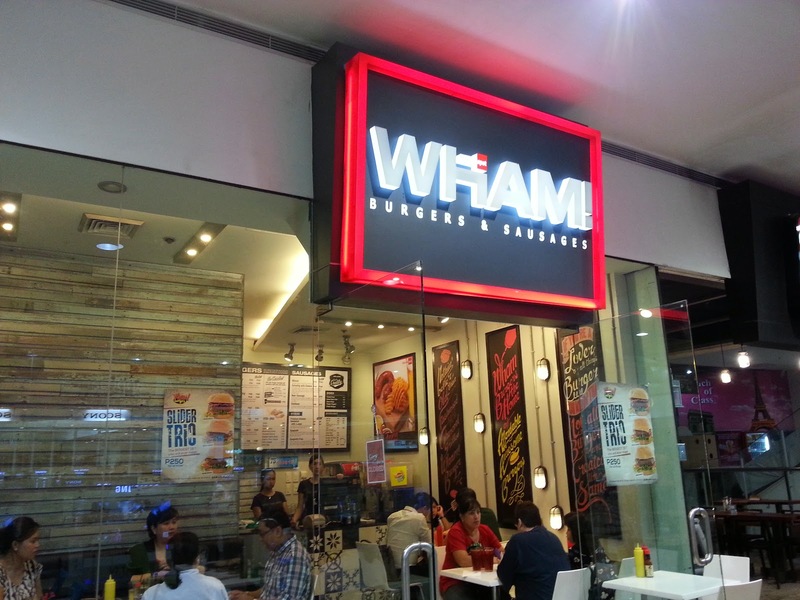 With the expansion of branches, Wham Burgers also got a face lift! New logo that is! I had a privilege to attend their exclusive food tasting event at their SM North, The Block branch! It was so rainy that day and I came all the way from Intramuros, so, when I tasted everything from Wham! Burgers & Sausages, it made my long travel worth it! I never tasted Wham! 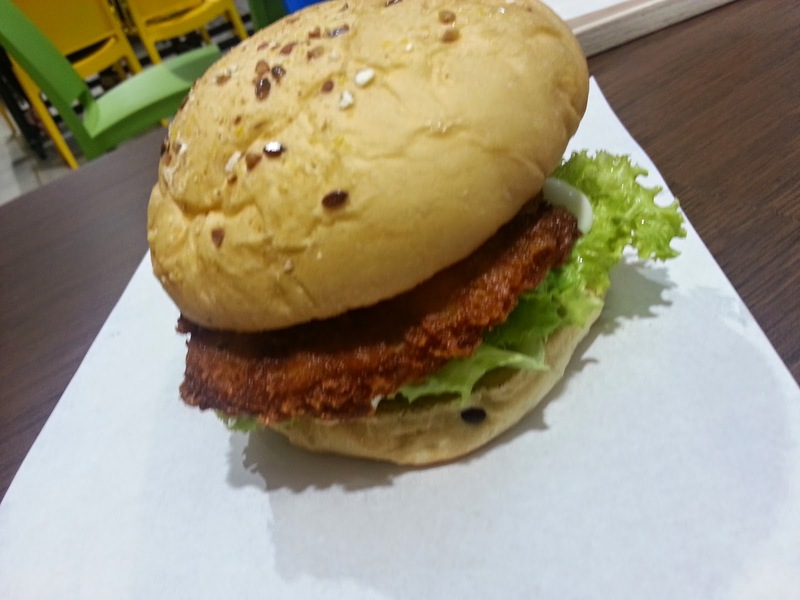 before, and I don't have any expectations, except to make my palate and tummy satisfied! And they did! They really hit the spot! 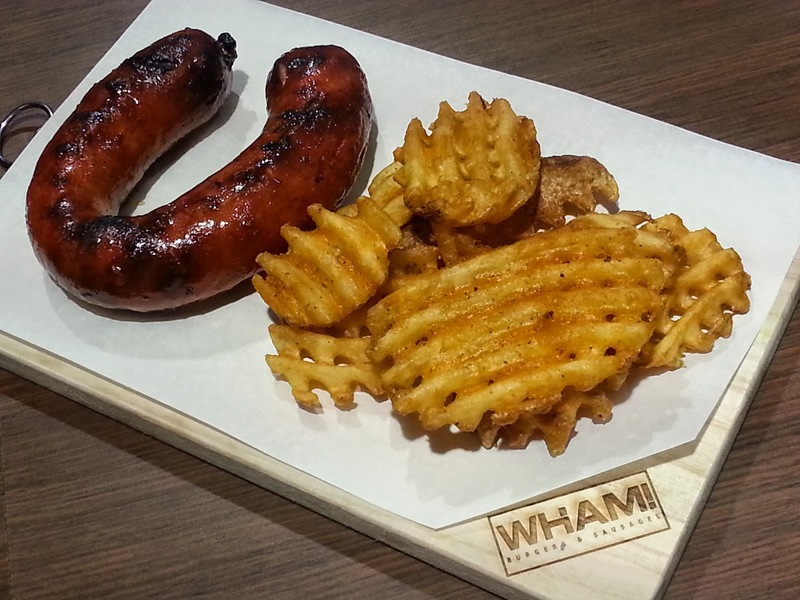 Get to know Wham Burgers and Sausages, a celebration of patty perfection along with other equally satisfying sausages bound to hit the spot on so many levels. 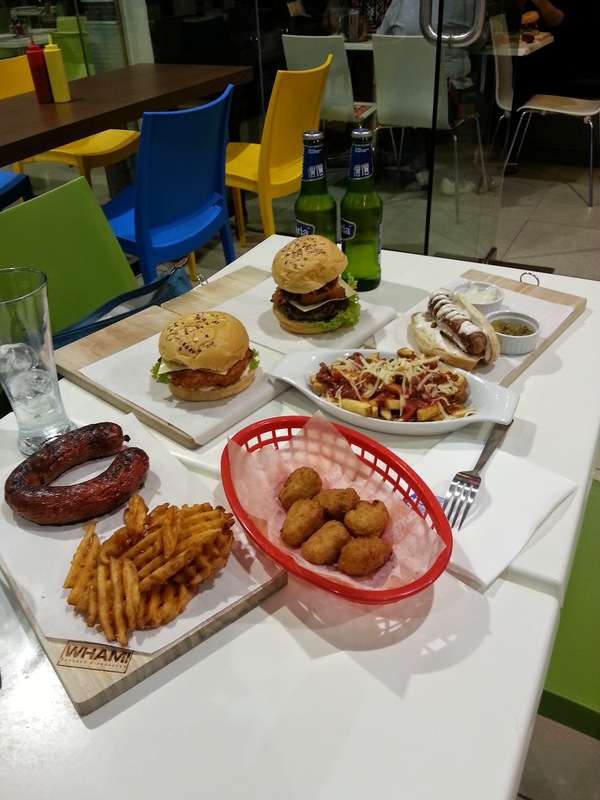 While its burgers with endearingly huge patty and signature smoky flavor remains the star in every creation, the new Wham Burgers and Sausages outlet is classy and classic combined, where all burger creations are delicately served on chopping boards. The buns get an upgrade too, as its now using an artisan brioche bun with 30% butter which kicks up its almost cake like taste. Certified premium and freshly baked, the texture is tight and heavy on soft crumbs which makes each bite consistently pleasurable. 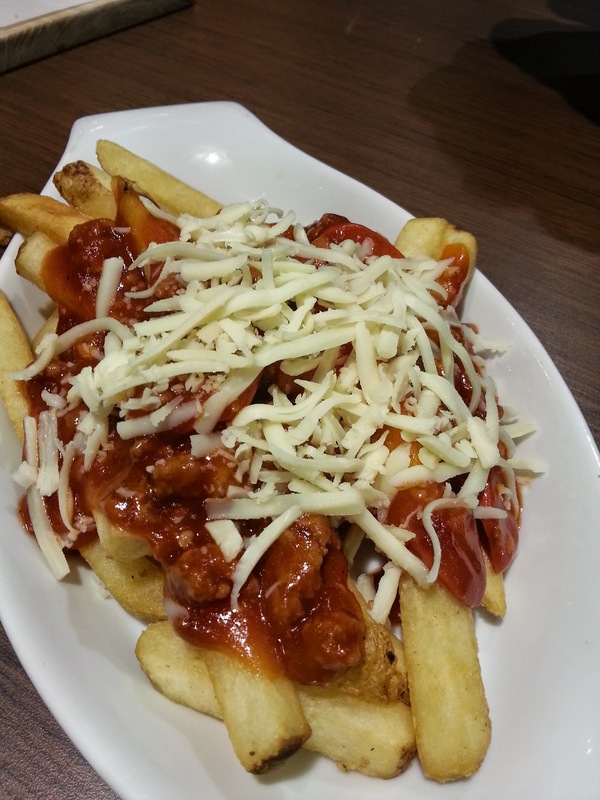 Spaghetti + Fries! Yup, it's possible! And oh so delish! Perfecting the one-third pound pure beef patties at 80% lean and 20% fat, Wham’s burger patties are gently seasoned only with natural flavor enhancers such as salt and black pepper. Whammer! Wham's signature patty with deep fried onion rings, tlc, and bacon! Double Whammy! Twice the yumminess! They're so big it's perfect for sharing! The Premium Chicken Sandwich with Cheese (P165) are for those who can’t get enough of the meaty chicken, crisp lettuce and sharp-flavored mayonnaise beautifully layered in a soft kaiser bun. Wiener. 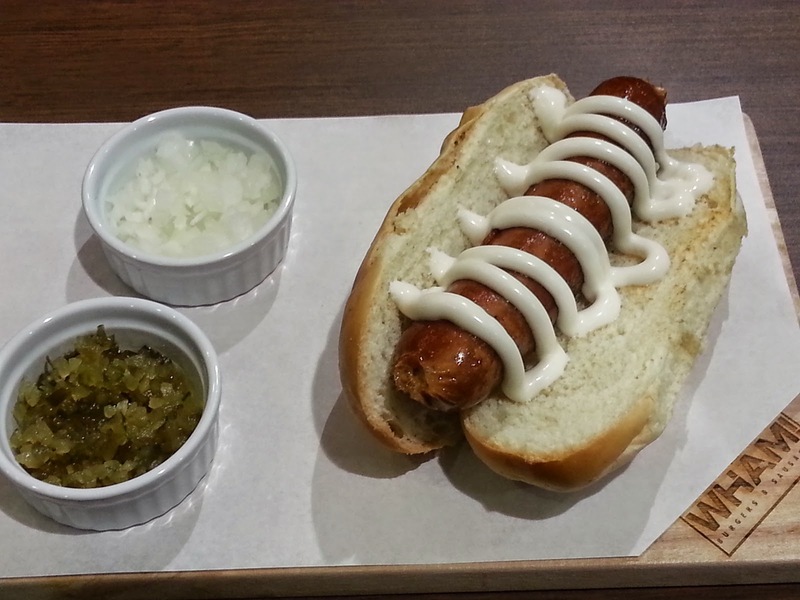 At a very friendly price of P135, the Wiener is a savory artisan recipe sausage made with original house blend ingredients. 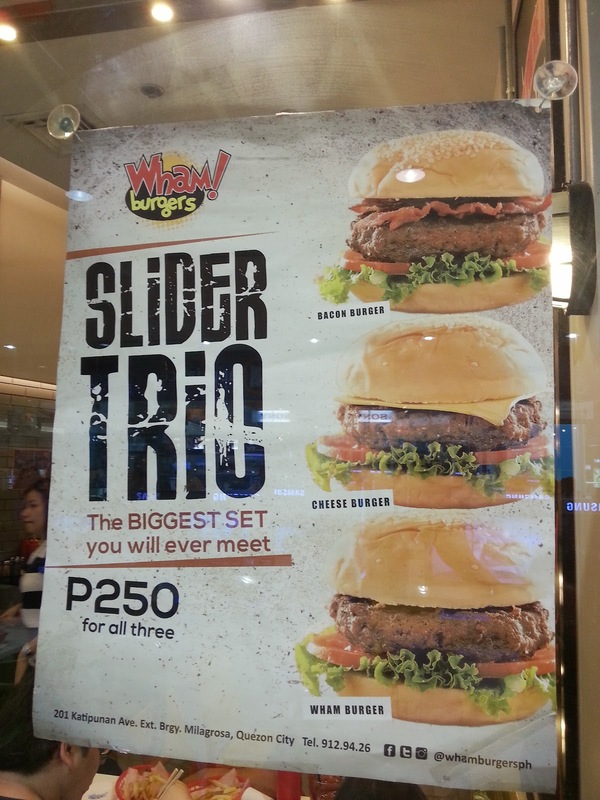 Visit their Katipunan branch and try their Slider Trio! 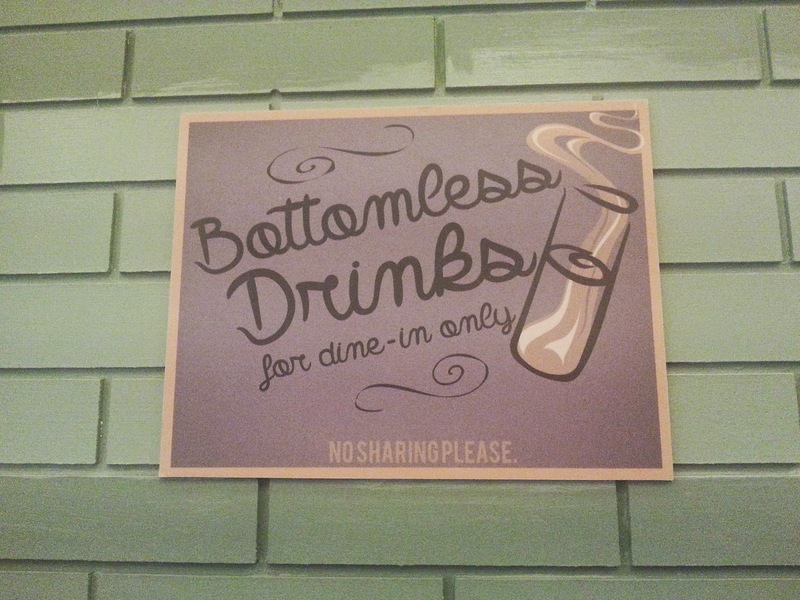 Bottomless soda is another insanely rewarding thirst-quencher and can truly make a difference to anyone’s burger indulgence. 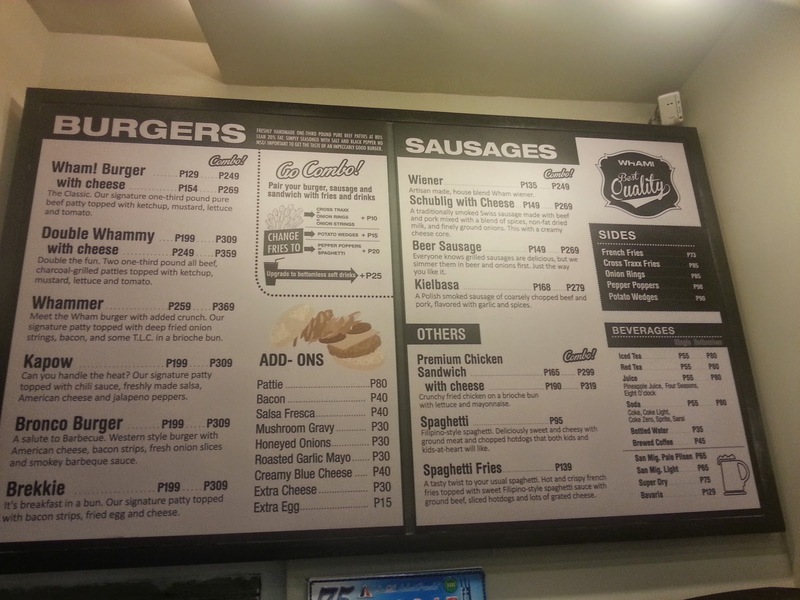 Craving for burgers, saugsages and fries? Check out their menu for their offerings! New on the menu! U-Turn Sausages! Oh, this is unforgettable! It was a love at first bite! Super delish! You really, really need to try this! :)) FTW ang sausage! 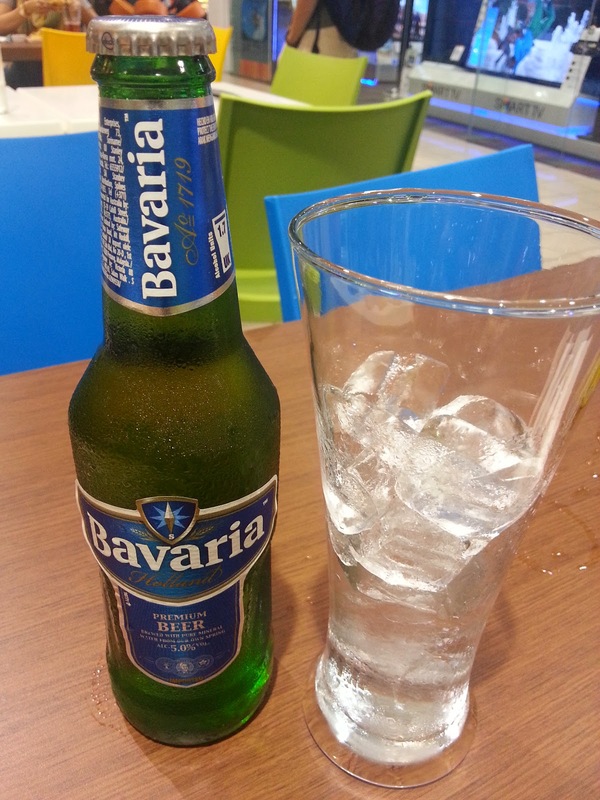 Another new in their menu: Bravaria Premium Beer. Holland brand Bavaria has a provocative light bitterness made from pure barley malt and wheat. 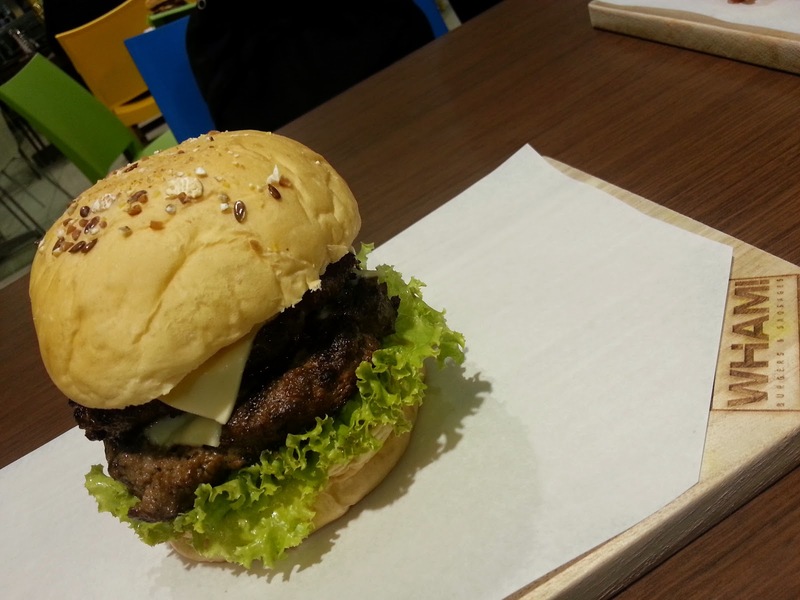 Forget about settling on expensive or cheap alternatives as Wham lives up to its promise of awesome affordable burgers. The new outlet is nothing but hip, modern and intricately constructed with a touch of outdoor picnic vibe—a hangout for families and friends getting together to enjoy a great meal experience that don’t cost a fortune. Thank you so much, Wham! Burgers & Sausages for having me, and for making my 1st visit a satisfying one! Can't wait to go back with my family! 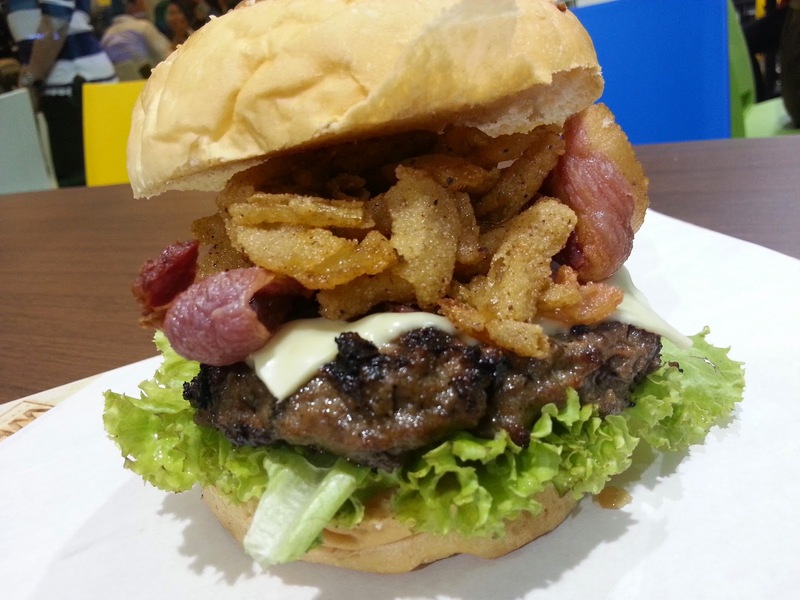 Wham Burgers is located at three branches: Katipunan, SM North Edsa (The Block), and Mall of Asia. For more information, visit www.whamburgers.com. Follow Social Media Accounts: Wham! Burger on Facebook, WhamBurgersPH on Twitter, and whamburgersph on Instagram. Check out new website at https://whamburgers.com/. Mukhang masarap, mother! dapat dalin ko si hubby dito :) Fave niya wham eh!